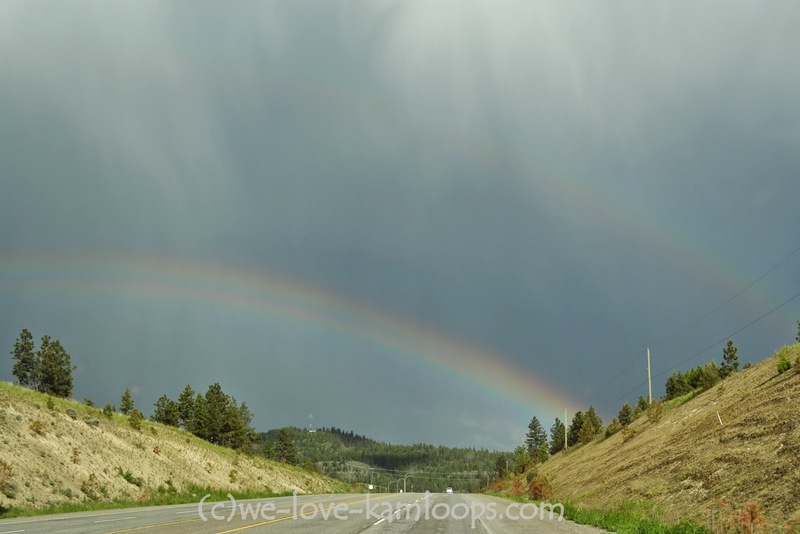 Springtime in Kamloops brings showers, and we need those showers to make our lawns and gardens happy. We love the green grass and have plenty of it to make our city pretty for the coming season. We can enjoy the green of our hills until the hot summer weather turns that to the sage and brown we expect. 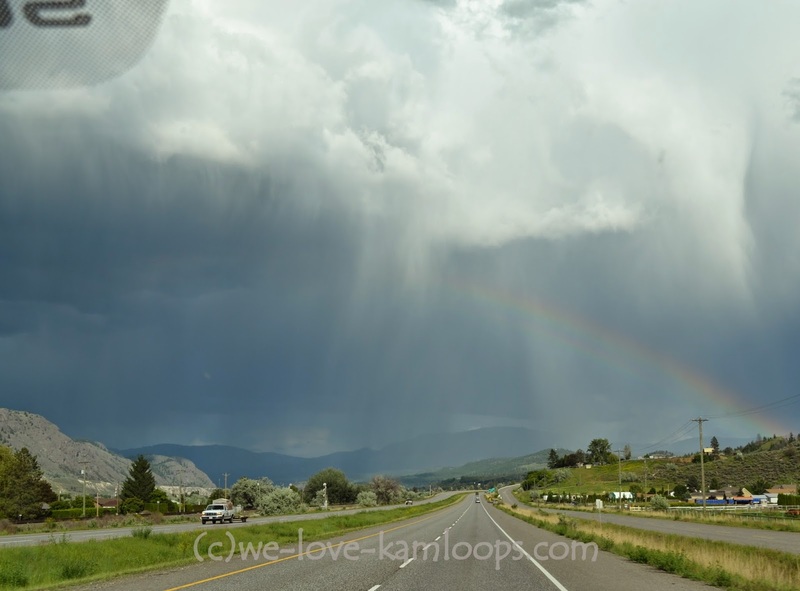 Some years it is hard to believe but Kamloops is a semi-arid region which means only 25 to 50 cm of rainfall a year and our average is only 21.8 cm so we do qualify. I think we say this every year but we seem to have had lots of showers this year plus we’ve seen some storms that offered some amazing light shows. 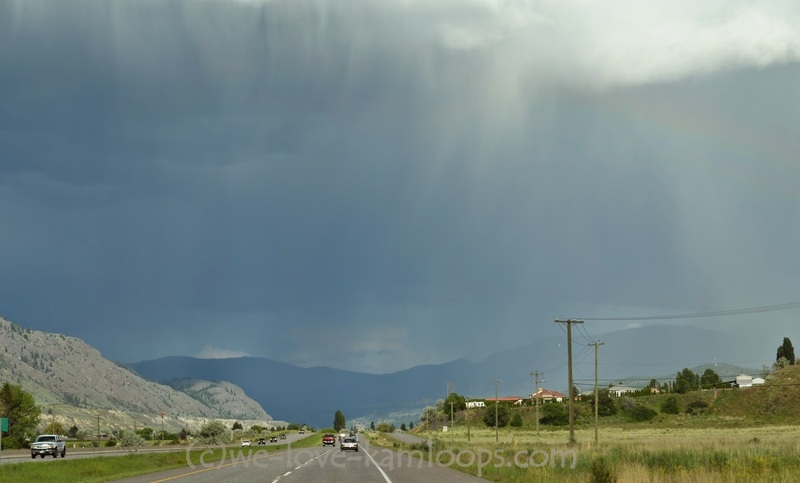 On a recent trip east of town, we were heading towards a black sky that looked like a very ugly storm was happening. 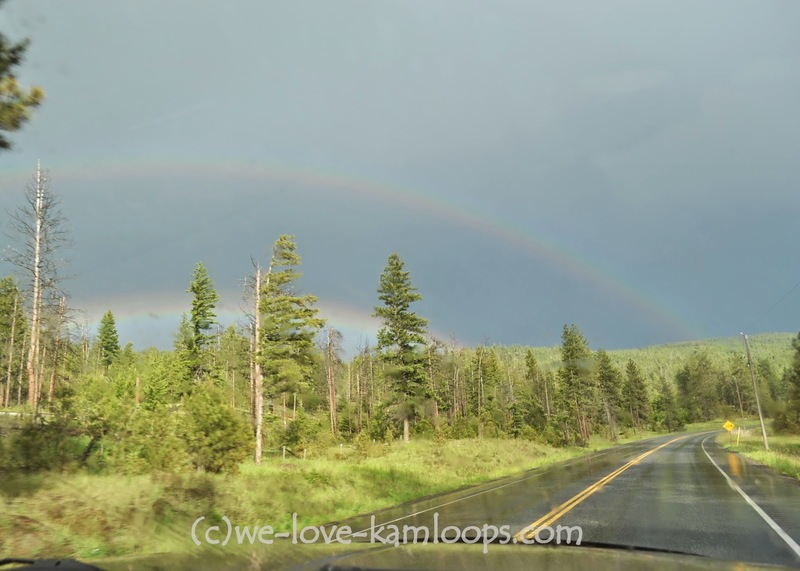 We followed Hwy 1 until we reached Monte Creek, where we saw a faint showing of a rainbow, then took Hwy 97 to head south. It looked like we had missed the big storm. 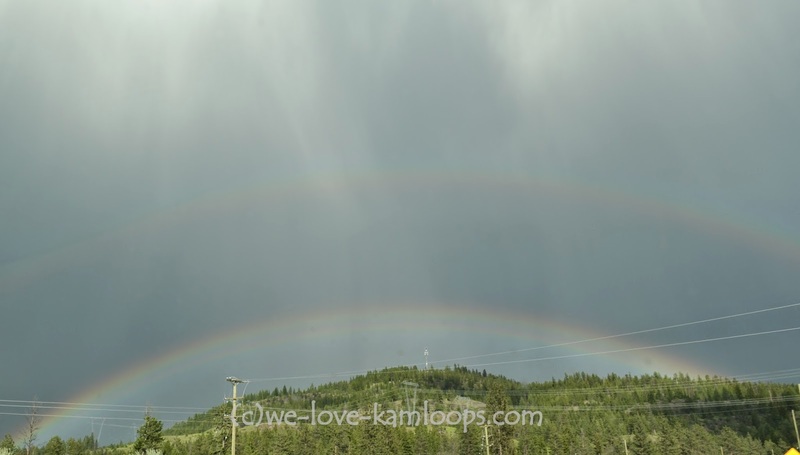 As we climbed the hill we could see the rainbow up ahead with a very faint second rainbow happening as well. The sun was working some magic with the raindrops and we were enjoying the view. In no time we could see a very definite second rainbow, I don’t remember ever seeing a double rainbow before, it looked amazing. That means there is twice the chance for a pot of gold at the end of the rainbow, better odds than usual. We are heading in the right direction! This piqued my interest so I had to ‘google’ the double rainbow to learn more. The rainbow is considered a phenomenon, as an optical one and a meteorological one. They are caused by both a reflection and refraction of light inside water droplets. Imagine the zillions of raindrops all lit up, that makes a rainbow! I remember learning the colors of the rainbow in early school days and memorized them by remembering the name ROY G BIV, for red, orange, yellow, green, blue, indigo and violet, with the red on the outer edge. 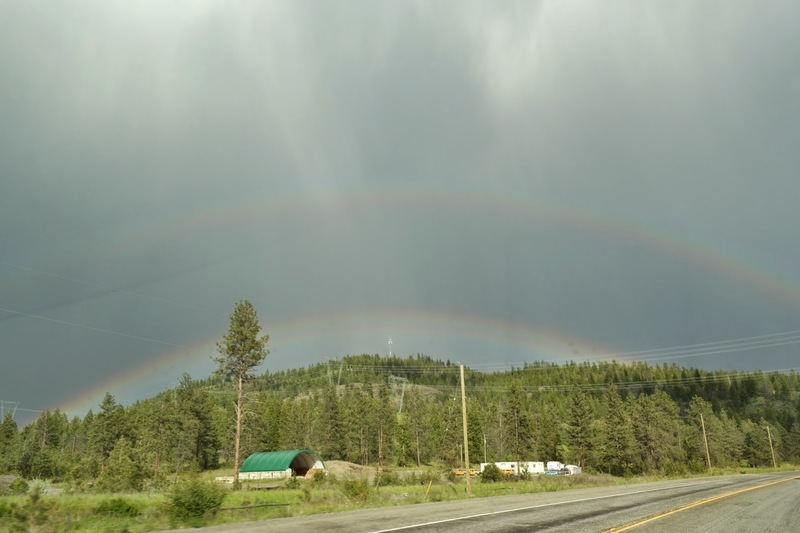 When there are the two rainbows, technically called a double rainbow, the colors of the second rainbow are reversed so the reds are facing each other. The light is reflected twice inside the water droplets. Interesting, huh? Everything has to be just right for a rainbow to appear; water, sunlight and Mother Nature’s magic. We watched that magic make a very strong arc across the sky for several minutes. We live in an area that has plenty of that magic to see. 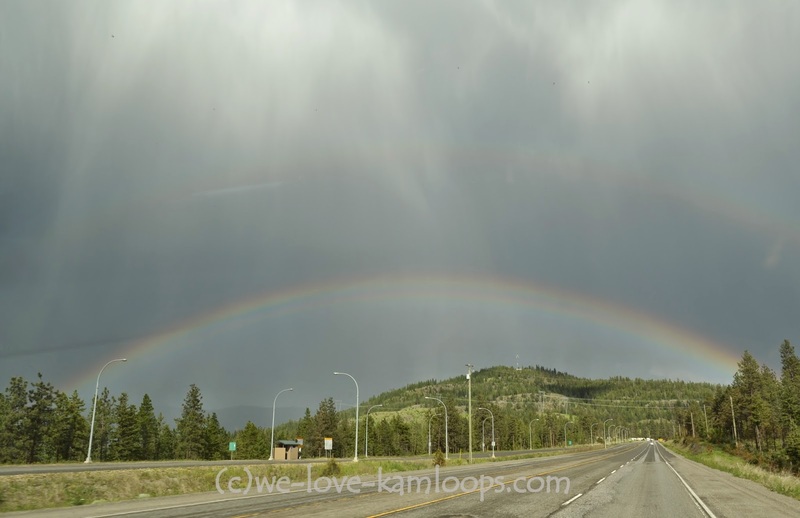 Kamloops offers four seasons, green grass, blue waters and 2000 hours of sunshine a year. Enjoy your summer. Well who knew about the mirror-image of the double/ second rainbow. Thanks for posting this. The other night, we had one appear here, and paid attention and passed it on to others who were also taking pics of it. So your post educated at least 6 others, and who knows how many will share it ?